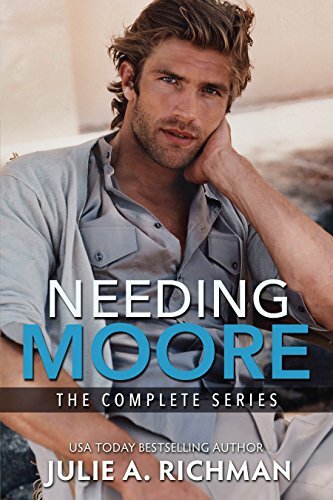 THE NEEDING MOORE SERIES~ SEARCHING FOR MOORE, MOORE TO LOSE & MOORE THAN FOREVER ~PLUS Bonus Chapters and a Sneak Peek at MOORE THAN A FEELING ~ Holly Moore's much-anticipated story! So, I got a surprise gift the other night at my birthday party, an old college friend casually mentioned he saw her on Facebook. Best present I've received in over twenty years. Now, I'm finally going to get my answer. She owes me an explanation at to why she left ... Damn, I loved her. I was having such a crappy morning at work and then his email arrived. It was a friend request and to say I was shocked would be an understatement. A lifetime has passed since we were last in contact. But just seeing his name on my computer screen, made me react in a way I thought I was no longer capable of, you see, I have never gotten over loving him, even though he betrayed me.